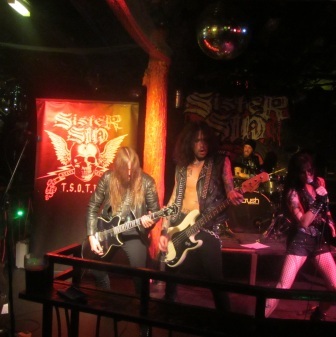 Satan’s Hollow established as a rock club in 2000, but formerly a shipping Warehouse, was the chosen venue for Sister Sin’s opening gig of their UK tour October 2013. The dance floor, which is in the centre, doubles as a stage for gigs. I have seen bands play ‘in the round’ as per The Royal Exchange Theatre, but for this gig there was a Sister Sin backdrop giving more of a stage feel. It’s a cracking venue with Devils (complete with horns and tails) light features, pillars dripping in candle wax and gothic style iron railings. Perfect for a rock gig! 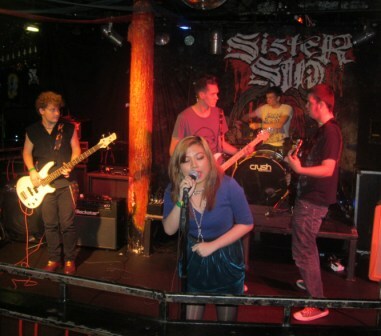 Opening the show were Nobody’s Hero, a female fronted rock band from Preston. I didn’t recognise the name but did recognise the band as it turns out they had recently changed their name from TimeBomb, who I saw supporting Dave Evans. First song was Take It Or Leave It, at this early stage there were only a handful of people. Playing mainly their own material guitarist Matt showed the most emotion – kneeling and playing to the audience. The others just need to loosen up a little, and look like they’re having a great time and not concentrating too hard. They did a good a cover of Sweet Dreams – Marilyn Manson style. For Supanova they had a bass/guitar change and not just the instruments the instrumentalists too! A nice touch when Matt thanked everyone for coming and said how Sister Sin were one of his favourite bands so it was honour to play on the same billing. Casey has a great voice and with this, and some great songs, I’d like to see them again. After their set I asked Matt why the band had changed their name and he explained that, as TimeBomb, people seemed to think they were a comedy band so they weren’t getting many bookings. They decided to change their name to Nobody’s hero, which is of one his favourite Rush songs and are now being taken seriously with more bookings than ever before. With his Bass Guitar held aloft, Andy nearly takes the glitter ball out! Next up come Cumbrian four piece Die No More, the venue was starting to fill up nicely. A coach load of fans had travelled from Penrith, that’s loyalty on a Thursday night! Die No More started off with Conscious Indecision which set the scene for a fast paced, heavy rocking show. 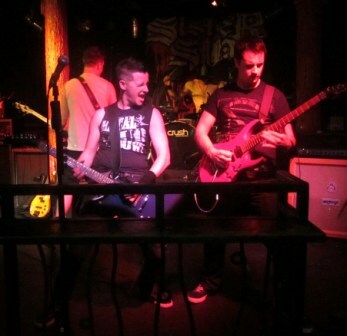 These guys love to play to the crowd and I’m convinced they’ve been practising their metal faces! With his bass held aloft I thought Andy was going to take out the glitter ball! Through Nightmares and Blood in the Veins to Oblivious, which is my favourite Die No More track. It’s got a fast punky beat and I suddenly felt a punch to my arm, luckily not a fight breaking out, just an over zealous fan showing his appreciation for the band and giving it his all with the fist pumping! The band dedicated The Next Big Thing to those who had come from afar, a nice touch to show appreciation to the, no doubt, growing fan base! Finishing off with another fast one, Council of War the lead track from their EP Blueprint. These guys get better and better – definitely one to see! The third band of the night came in the form of Blue Origin from Stoke. Opening with Take Your Pills, visually they were brilliant but the sound was a little distorted in places. Nick covered the stage well and was up on the drum kit giving it his all! During Whatever Happens Nick managed to slip but the recovery was so swift, the untrained eye might not have noticed. Take Your Pill, about making love came next, this one is a loud, fast number so, not exactly romantic but, if you like your love a bit rougher then this could be the song for you! A quick beer break ended by a Scream, from the bowels of Satan(s Hollow). The band brought out their signature Floor Tom and gave it a good beating. A lively and energetic performance from Blue Origin but they needed to get Josh’s mic turned up because I couldn’t really hear him but could see that he was singing his heart out! Ending with Godless, which is perfect for Satan (and his hollow). Another one I would recommend seeing. Blue Origin: A rear view! 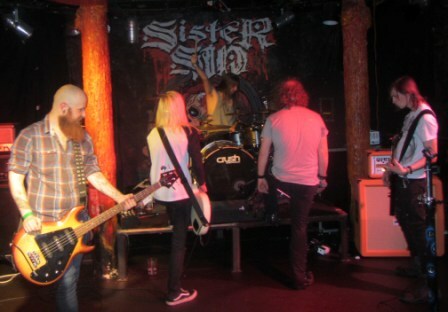 Finally came the headliners, Swedish female fronted rock band, Sister Sin. The three musicians did a short intro then Liv stormed on to the stage. The ultimate rock chick in a tight black leather top, shorts and ripped fishnets. With long black hair flying everywhere, she’s petite and slightly built so you wouldn’t expect such a powerful voice, sounding a bit like the female equivalent of Vince Neil. Opening with End of the Line a good fast rock song. One Out of Ten led to Fight Song both with riffs aplenty and sounding a bit Crue-esque. I got to watching Dave on drums and decided he looked a bit Rancid! Not literally but, with his full beard and woolly hat he reminded me of Tim Armstrong. I don’t think that guy ever stopped smiling. It was great to see someone who so obviously enjoys what they are doing and doing it well. On Parole brought out Liv’s powerful vocals and Beat em Down had a good fast drum beat. For Morning After Strandh (who resembled a pirate – think there’s a nautical theme in my reviews) took to the keyboards for a slower mellower start before returning to his bass for a climatic ending. After On Parole, which wasn’t a cover of Motorhead, we did indeed get a Motorhead cover in Make My Day, with Liv kneeling as if prayer to Jimmy. Finishing off with two songs, firstly Sound of the Underground, a fast rocking number much more akin to Girlschool than Girl’s Aloud! 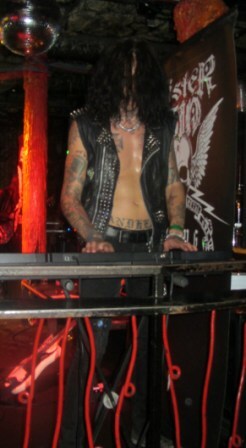 Finally Better Than Them brought us to the ended of a fantastic show with flavours of Crue, Skid Row and Guns ‘n Roses. 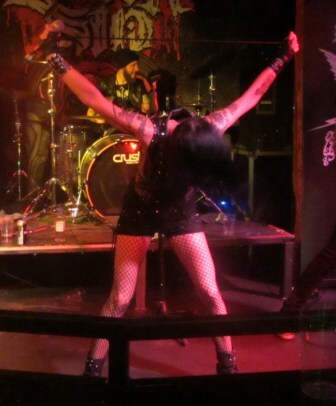 Sister Sin have just finished a UK Tour but will be playing a few dates in Europe. 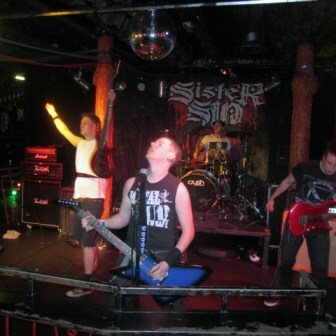 Sister Sin at Satans Hollow, Manchester on the opening night of their UK tour.